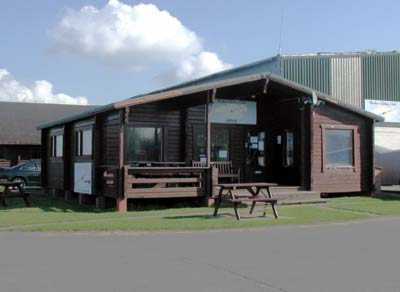 Wycombe Air Park is conveniently located for access by public transport (train and bus), car and air. It is approximately two miles south-west of High Wycombe. By Road: for Sat Nav use post code SL7 3DP. From M40 Junction 4, take the A4010 (Aylesbury Road) turn. Go to the third roundabout and turn left (signposted Lane End). One mile on, the airfield is on the right (signposted Wycombe Air Park). The main car park is about 50m on the right. If you are coming down the M40 from the North, then it may be easier to leave the M40 at Junction 5, Stokenchurch. Turn left off slip road and in to Stokenchurch on A40. After about a mile turn right on B482 (Signpost Lane End, Marlow) and follow this for 7 miles. About a mile past the 30 MPH speed camera!! in Lane End, turn left on Clay Lane (signpost Wycombe Air Park). The airfield entrance is a further half a mile on the left. Either of these routes is fine towing a glider trailer, but if you leave the M40 at J4 be careful not to miss the A4010 turn off! High Wycombe is served by Chiltern Railways. A regular service operates from London (Marylebone) and Birmingham. The rail journey from London takes around 30 - 40 minutes. From High Wycombe a taxi journey takes around ten minutes. Alternatively, bus service 315 operates from the town centre and takes around 20 minutes to the Air Park. There is a tarmac runway and a grass runway for powered aircraft on R/W 24/06. R/W 35 is a grass runway. Gliders operate on their own grass areas, which are parallel to the 'power' runways. Circuits are in opposite directions with glider circuits to the South when R/W 24/06 is in use and to the West when R/W 35 is in use. If you are thinking of arriving by aircraft you must get a briefing from ATC. There are strict noise abatement areas and non-standard circuits in operation, and radio is mandatory. The tower can be contacted on 01494 529261. GPS co-ordinates are: N51°36.693' W000°48.510' BGA Turning point BOO. Contact Wycombe Tower on 126.55, Wycombe Ground on 121.775.